Sugata Mitra, winner of the 2013 TED Prize, reminds us that, as educators, we may be so consumed by teaching that we ignore learning, that there’s a fundamental difference between teaching-centered and learning-centered. Mitra is his own best model for his vision of education, or SOLE, for self-organized learning environment. SOLE is a more formal school-based version of Mitra’s earlier hole-in-the-wall (HIW) street learning environment. Both, however, are grounded in his theory of minimally invasive education (MIE). Mitra is, by training, a physicist, but by temperament, a self-organized learner. The heart of his gift is curiosity, and his scientific training provides the rest. He didn’t begin by studying teaching. Instead, he studied learning. 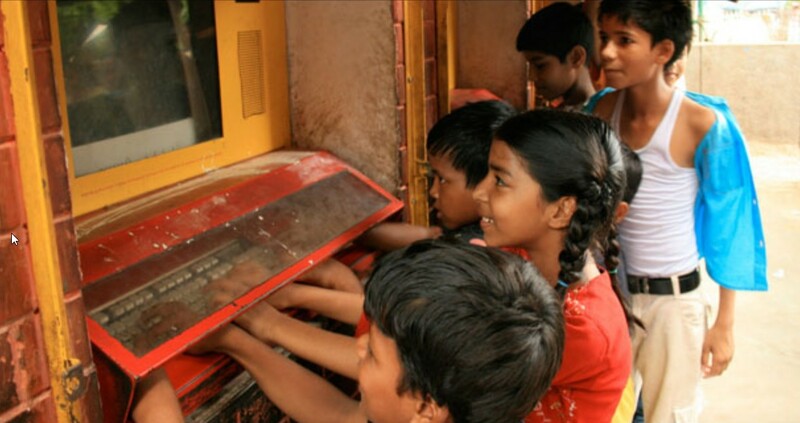 He placed a web-connected computer in a kiosk in a Delhi slum, left it on, invited children to play with it, stepped away, and watched. The question, simply stated, was: Can students learn without teachers? He was amazed to learn that, yes, they can. They learn individually and in small groups, and they teach one another what they have learned. Out of his observations, he drew implications, and the most important is that both teachers and computers are technologies, or media for learning. That is, children can learn from either or both. With this awareness, he realized that in cases where schools and teachers are scarce or unavailable, computers could suffice. The question that remained, however, was: What does this mean, if anything, for traditional models of learning that rely on schools and teachers? In an interview with Joshua Brustein, Mitra says, “I came to England in 2006, and the schools said, why aren’t you doing it [HIW] here? So I did, and I realized that what I’ve got has nothing to do with poor children. It probably is just a new way in which children learn in this new environment. It needs two things. First, broadband…. The second thing is, it needs the teacher to stand back” (“One on One: Sugata Mitra, 2013 TED Prize Winner,” NY Times, 27 Feb. 2013). In this new environment, the key interactive variables are peer evaluation and peer recognition – not teacher guidance or feedback. “There are some interesting things about children working in groups,” says Mitra, “if those groups are self-made. Once you let children do that, the system has a self-correcting ability” (Brustein). For teachers, this means that their “job has changed,” says Mitra. “We need teachers to do different things. The teacher has to ask the question, and tell the children what they have learned. She comes in at the two ends, a cap at the end and a starter at the beginning” (Brustein). Mitra makes an interesting distinction when he says, “At first I thought that the children were learning in spite of the teacher not interfering. But I changed my opinion, and realized this was happening because the teacher was not interfering” (italics added). In other words, minimally invasive education is not a negative experience but a positive one, it’s not a disadvantage but an advantage, it’s not less but more, it’s not a glass half empty but a glass half full. In short, when teachers “stand back” and get out of the way, they’re not hindering learning. Instead, they’re facilitating it. If Mitra’s views seem familiar, it’s because they are. This is the constructivist theory behind the MOOCs originally created by Stephen Downes, George Siemens, Dave Cormier, and Bryan Alexander. They, too, understood that the medium is the message, that the web is a learning technology for the 21st century just as teachers and classrooms were the learning technology for the 19th and 20th centuries. This new environment, they correctly observed, invites minimally invasive approaches. Downes and his colleagues set up their MOOCs and provided minimal handholding, inviting the students to allow their natural web learning instincts to kick in. The key interactive strategy was networking among peers – not teacher-led activities. The emphasis was on learning and the learner, not teaching and the teacher. Interestingly, Mitra’s ideas and MOOCs are both disruptive, taking root outside the traditional confines of campuses, classrooms, and teachers and gradually impacting existing educational institutions. The fact that their unifying element is web technology should be a signal that the medium is the message, that the medium must shape 21st century education. Interesting observations. Must you have broadband for students to learn in groups? Must they be self-forming? Here’s a quick story of an unusual teacher I encountered in sixth grade, long before computers were common, let alone Internet. Television was black and white then, but that has nothing to do with this story. This is how I really learned basic geography — identifying countries and states along with major bodies of water. Capital cities came along too. As was common in those days, desks were in rows. The room was large enough so that much space was available outside of the desks. Our teacher had a very interesting prop. He had pull-down maps of the U.S. and of the world. Unlike most, these had only the boundaries outlined and no names. On student was the moderator and stood at the front of the class. This student often was the best performer of the previous occurrence of this activity. (The teacher moderated the first one each year.) This was considered to be a prestigious position. The first student in the first row stood behind the second student in that row. The moderator used a pointer to point to any spot on the map. The first student to name it moved on to stand behind the next student in row. Everyone was focused on this competition. There was no talking or disruption. It had similar engagement to the many TV shows that use knowledge competitions, e.g. Jeopardy! The teacher just sat back and watched. He had set out the rules and then let it become a student-run activity. He started and capped off each event. During free time, some of us would gather in small groups and test each other on what we knew. Where are the Bering Straits? What is the island off the south coast of India? Point at a state and say the capital. Yes, students can help each other learn. Broadband is not necessary. Neither are computers. Those small groups outside of the formal competition were also informal, friendly competitions with students looking up information outside of school to use the next day. I appreciated learning from that experience. I cannot imagine just being asked to learn the locations of a bunch of countries and doing it. That would be horribly dull. The way we did it was fun. Best of all, we were able to showcase our learning in front of the entire class. Anyone could play because it only required memory. Memorization is not our greatest goal in learning. Sometimes, it helps, though. I can tell you that throughout my life, my mastery of global geography has been very useful when hearing about world events. They make more sense when you understand where they occur. I am using SOLE in my class on a daily basis. I have noticed a number of things. Student behaviour issues have virtually disappeared. Their groups are making sure everyone is involved as one person in the group is being called on to present and they won’t know who it is until it is time to present. It is also what I call the great equalizer. One of my weaker students came up to me and said he enjoyed SOLE. I asked why. His reply was that for the first time he felt like part of a class. He did not have to see himself competing with the better students because he knew he couldn’t. SOLE has allowed him to see that he has much to offer as anyone else and allowing him to work in this setting has made it happen. As my students say this type of work is not boring. They like deciding on the topics. They like being in charge of their work. They have become confident speakers and are becoming much better at adding explanation to the basic facts they find. I supplement their learning by inserting the parts of the curriculum where needed.